oh, and those knee pads? not even close to where her knees are. cute though. *not that i was entirely slack all weekend, i just spent most of my time taking advantage of the large table area to trace patterns out of japanese craft books, baste quilts and cut out quite a few things for future sewing. Really really cute. 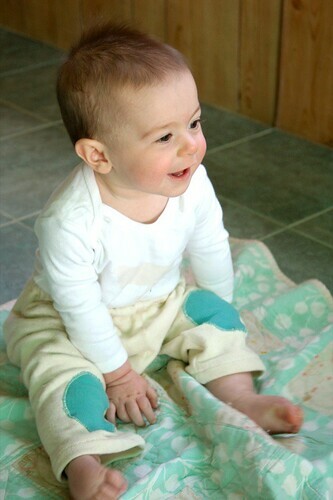 I'm trying to figure out how to make similar pants for my 7-month-old boy - suggestions when making your own pattern? thanks gina! hmm, suggestions... well, considering i revised this pattern four times, i don't know if i'm the one to ask : ) i didn't cut apart the pants i wanted to copy, just tried to figure out what the shapes were. i took measurements at various parts of each piece to try and get the sizing right (and still got it wrong three times!) and then would sew a prototype out of plain cotton to see how it was coming together. i won't lie to you, it took awhile, probably about three hours of me redrafting the pattern before i got it the way i wanted it (the pants i copied have three pieces, making them a bit harder than most baby pants). i just get stuck on some thing and won't give up! As far as I am concerned, you always intended them to be shin pads. She doesn't seem to mind the whereabouts of the knee pads. She looks so happy!